As the Western world struggles to come to terms with a hostile Russia, many in Ukraine fear that their country’s own Euro-Atlantic ambitions could yet be sacrificed to appease Moscow. Indeed, some believe a geopolitical perfect storm is currently heading straight towards Kyiv. Recent comments by European Commission President Jean-Claude Juncker calling for an end to “Russia-bashing”, coupled with German support for Moscow’s Nord Stream II pipeline project and French President Emmanuel Macron’s charm offensive in St. Petersburg, have led many Ukrainians to conclude that Europe is losing its appetite for confrontation with the Kremlin. Meanwhile, mounting frustration with Ukraine’s own meandering post-Maidan transformation is making it harder and harder for the country’s international backers to justify further costly support. Kyiv-based Frenchman Olivier Vedrine argues that in light of this increasingly unfavorable climate, it is now more important than ever to underline exactly what is at stake in the struggle between Putin’s Russia and the Western world. Vedrine remains convinced Ukraine will be the decisive battleground in this showdown. He is on a mission to bring this message to European audiences. “Ukraine is the key,” says Vedrine as he sits down with Business Ukraine magazine for lunch in one of Kyiv’s many elegant French restaurants. “Europe simply cannot afford to let Ukraine fail, and Russia cannot be a truly global power without Ukraine. So all roads lead to Kyiv.” The Frenchman is a political scientist and TV host who has been based in Ukraine since 2012. He arrived in the Ukrainian capital following a career in academia and a long-standing role as a spokesperson for the European Commission. 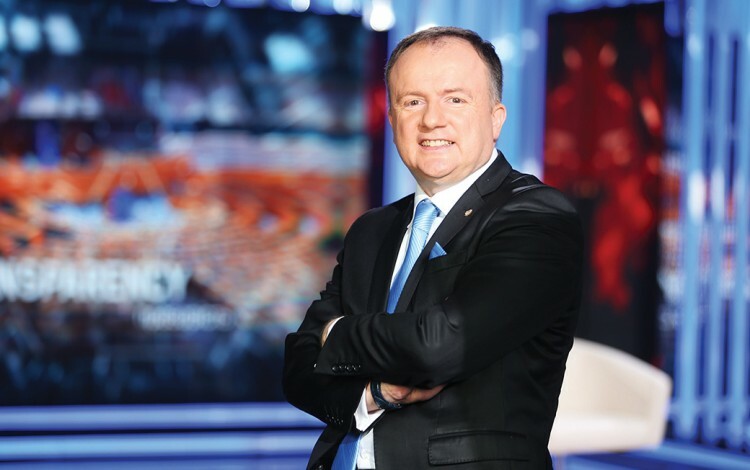 Vedrine is currently best known as the presenter of weekly English-language TV show “The Western Voice”, which airs in the original English and in Ukrainian translation on Obozrevatel media holding’s TV channel OBOZ.TV. Launched in December 2017, the show is Vedrine’s latest English-language venture as he strives to raise Ukraine’s international profile and provide foreign audiences with access to credible information about a country that he sees as still struggling to emerge from many decades of deliberate disinformation. “Even today, perceptions of Ukraine are still not very clearly defined in the Western world. These perceptions have long been distorted by Russian propaganda campaigns and russocentric narratives stretching all the way back to Soviet and even Tsarist times,” he says.